Improvements:An extremely popular 10-year-old river front cabin with beautiful views from the large deck. There are three great campsites with picnic shelters, city water, and access to electricity on the property. Thirty-two acres of CRP ties several thickets together and makes for great deer hunting. Two impressive rock landings provide access to the Mulberry. Comments-Round the Bend consists of 120 acres bordering the Pig Trail Scenic Byway and the National Wild and Scenic Mulberry River just a half mile from Turner Bend. Natural gas, city water, excellent cell service, high speed internet access, weekly trash service, and electricity make this property even more attractive than it would be on its own. One of the vest fishing holes on the Mulberry is on the property and there are three deer stands. Guests staying at the Round the Bend Cottage frequently ask to purchase the property. 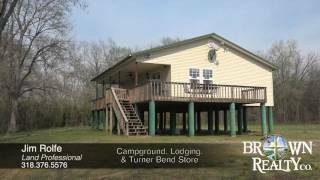 Current Turner Bend owner generates income from renting the cabin and campsites. You could greatly expand the cabin rental business on this property or use it as your own private retreat.